Never let it be said that Hollywood is running out of ideas, as after A Bad Moms Christmas where the ladies mothers came to stay, in Daddy's Home 2 it's time for the fathers to come home for the Holidays. In the first movie Will Ferrell's character 'Brad' struggled to get his stepchildren to love him and see him as their dad with their cool biological father 'Dusty' (Mark Wahlberg) still in the picture, but this time around it's double the discomfort when both their respective fathers (John Lithgow and Mel Gibson) come to stay under the same roof during the stressful festive season. These movie sequel billboards were spied along West Hollywood's Sunset Strip, La Brea Avenue and Pico Boulevard from October 4 to October 18, 2017. 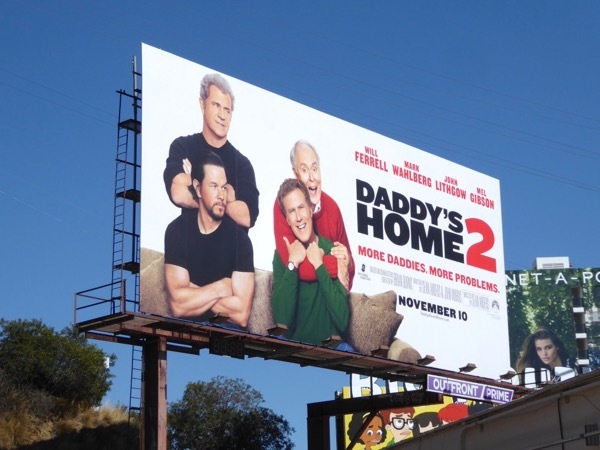 Fans of the comedy can also enjoy these movie billboards for Daddy's Home from 2015, plus admirers of the film's stars can also check out all these Mark Wahlberg billboards, these Will Ferrell billboards and these John Lithgow billboards. 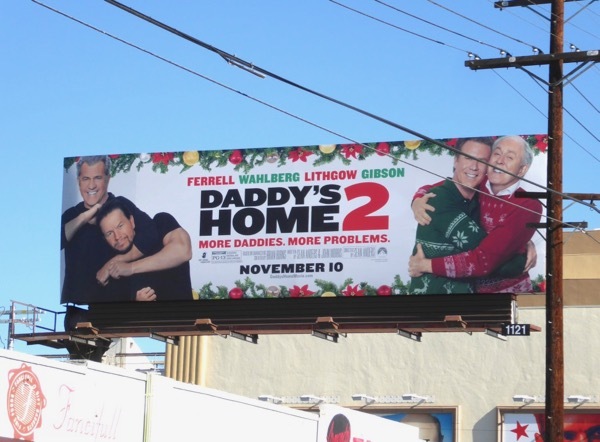 In real life you can't choose your family, but in a Hollywood comedy you can, so let's see if double the daddies will make for twice the fun this November. UPDATED: Here's another ad creative for the movie snapped along Melrose Avenue near Paramount Studios on November 18, 2017. Daily Billboard wishes they'd had more versions of this billboard filling the skies as it's a lot more festive and fun.